What is a /24 or a /22? IP address are divided into portions. One part identifies a network and the other part identifies a specific machine or host within the network. IPv4 subnet masks identify the range of IP addresses that make up a subnet, or group of IP addresses on the same network. For example, a subnet can be used to identify all the machines in your house, building, department, geographic location, or on the same local area network (LAN). In IPv4, the subnet mask 255.255.255.0 is 32 bits and consists of four 8-bit octets. Example thhe address 10.10.10.0 subnet mask 255.255.255.0 means that the subnet is a range of IP addresses from 10.10.10.0 - 10.10.10.255. 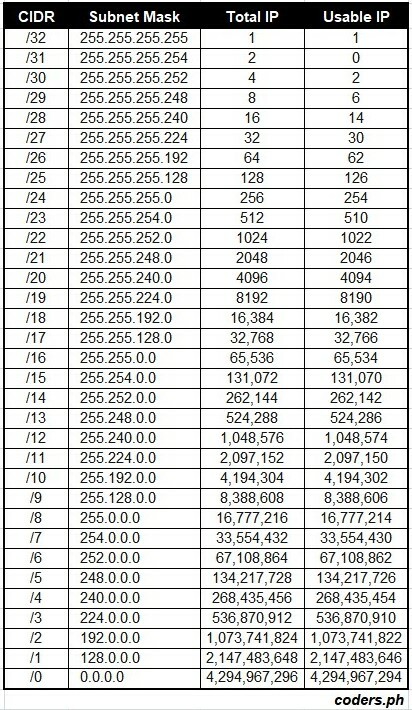 Below is a guide for us to know how many usable IPv4 address is given to us.